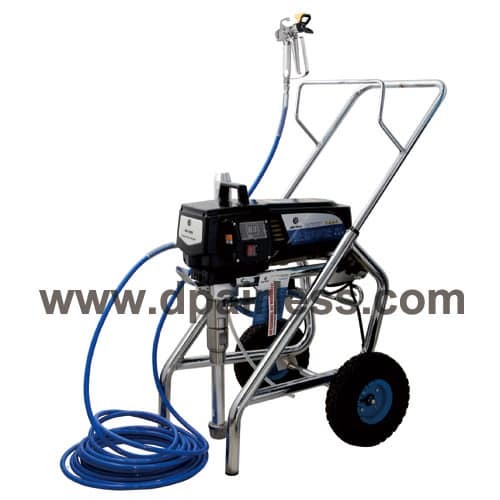 DP-9800E / DP-9800G Hydraulic Airless Paint Sprayer is UPGRADED hydraulic model with DIRECT TRANSMISSION, no need belt, higher transmission efficiency. The perfect choice for large areas and intensive usage. The most helpful machine for the professional contractor who is looking for workhorse hydraulic performance for large commercial and residential construction jobs. 1pc hydraulic airless sprayer machine, 1pc airless spray gun(with #341 tip), 1pc 3/8”NPSM*15m high pressure hose 1pc 50cm extension pole, 1pc lubrication oil, 1 set tool set, 1pc manual. Advanced Direct Transmission, no belt, more transmission efficiency. Compact size, light weight, with trolley and wheels, convenient to move around. Gasoline engine type is optional. Big Hydraulic Oil Container up to 13L. The more oil inside, the less temperature machine is operating, and less wearing for the spare parts. Separated type fluid pump, easy for disassembling and after sales maintenance. Inorganic zinc and micaceous iron paints basement sealants.